Sydney Shop Girl: The Weeknight Book Club: Battle Hymn of the Tiger Mother, Amy Chua. The Weeknight Book Club: Battle Hymn of the Tiger Mother, Amy Chua. Multiculturalism is back in the headlines and collective consciousness in Australia this week. Recent events here have had many people question what it means to have tolerance for one another's religious and cultural differences. Freedom of speech and thought is the right of every Australian but the way that small sections of the population choose to exercise these rights exploded over the weekend in Sydney when a protest over an anti-Islam Youtube video morphed from a peaceful protest into a riot that took over the normally peaceful CBD shopping district. Last night, Frank Lowy the Australian-Israeli businessman who co-founded the Westfield empire delivered a speech to the Australian Multicultural Council in which he spoke of the need for new migrants to Australia to keep their side of the bargain by respecting the standards and values of the country they now voluntarily call home. He spoke of the 'remarkable things that can happen in a remarkable country'. All of which has been an interesting context in which to finally read Amy Chua's 2011 memoir, 'Battle Hymn of the Tiger Mother. A work that roared into the world's attention with an explosive article in the Wall Street Journal which some feel was an unfair and sensationalised reading of the book but I have, unfortunately, come to realise wasn't too far off the mark. I never read 'Battle Hymn' at the height of its controversy because I didn't feel it would anything positive, enlightening or even entertaining to my life. I've just read it over the last couple of days out of curiosity and as a comparison to the series of books I've read written about parenting by American expatriates in France. There are a few reasons I've drawn this long bow to connect the current challenges to Australia's multicultural identity and this book. Chua writes of a great pride (she writes of everything she does with great pride be it actual or 'self deprecating') in her Chinese heritage and her ability to embrace 'the best' of her new home in America and 'the best' of her husband's Jewish faith all of which combined in her superior brand of Asian Parenting Alchemy to achieve results in her children (but not the family dogs). One of Chua's academic interests is the role of ethnicity in law. There were times when reading this book when I wondered if ethnicity was being used as a lazy explanation for all of Chua's actions. 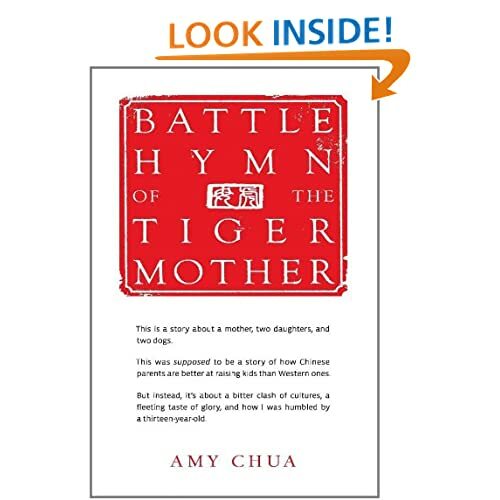 Before I review the book, I need to clarify that my opinions are based purely on what Chua has chosen to reveal of herself and her family in 'Battle Hymn of the Tiger Mother'. She admits to the novel being at times self depreciating and self mocking and that it is not a 'how to' manual of parenting. Chua herself is a celebrated Law Professor at Yale. She has defended herself at the media interviews given in relation to the book and my opinions here are in no way intended as a personal attack. They are, instead, a surprisingly violent response to her writing and the way she has chosen to portray herself and her family. 'Battle Hymn of the Tiger Mother' is Chua's memoir of how she raised her two daughters Sophia and Lou Lou with the burning desire that they not fall victim to the 'third generation curse' of successful families. This curse refers to the comfort and privilege being conferred onto children as a result of the hard work of their parents and grandparents before them. These children become spoiled, lazy and entitled and hence have no desire to work as hard as their forebears. Spurred on by this fear and perhaps her own drive and ambition, Chua pushes her children into careers as child prodigy musicians who play only the 'superior' instruments - violin or piano. Predictably, this is not an easy road when you're also a professor and a wife. Chua tells of how excessively 'sympathetic' she is to her students, especially those of Chinese heritage. Not sure why but there you have it. She limits discussion of how her husband Jed feels about the way the children are being raised as he should be allowed to tell his side of the story in his own words. However, the rest of Chua's life seem to pale in significance when compared to her ultimate goal of her daughters' musical careers. She writes of family holidays in a way which is telling. Two paragraphs listing all the cities she and her husband take their daughters two are followed by chapters of how Chua managed to access pianos whilst away. Her daughters were forced into '10 minute' practice sessions whilst their grandparents waited in the hotel lobby for dinner. Hours of practice were required before being allowed out to 'see the sights'. Chua details her great joy in practically living at her daughters' music school. The hours she spends reviewing notes from her daughters' classes. The extent she will go to in order to secure her daughters the best tutors possible. She begins the novel declaring that Asian parents deflect the praise they receive for their children's achievements but has no problem with cataloguing the praise she herself receives throughout the book. Sophia, the elder daughter is fits in well with her mother's vision. She excels with each challenge and reaches the ultimate peak with a performance at Carnegie Hall. Chua is jubilant and a grand reception at a nearby five star hotel is held in Sophia's honour. The great pride is tempered though when Chua realises that the area of Carnegie that her daughter performed in was not the largest or 'grandest' auditorium. Next time, perhaps. Lou Lou, the younger daughter is a challenge and is with her that Chua find herself harnessing all her Tiger energy (and personality traits). Lou Lou reaches and age where she will not do what she is told. Punishments, no matter how degrading, are suffered without fear or a change in behaviour. Lou Lou's Chinese grandparents (and presumably proponents of the Asian Way) notice the sadness in their granddaughter's eyes and plead with Chua to give things a rest. But no, our heroine sees this as a battle of wills from which she can be the only winner. I think the self mocking element in the retelling of Lou Lou's story is when Chua observes that perhaps she shouldn't have come down so hard on her daughter. I can't be sure of this though. The memoirs end when Chua's daughters enter college. Lou Lou find fulfilment in tennis which she does on her own, without Chua's involvement. She does however return to music on her own terms. Of the two daughters, Sophia is the only one to have a letter published that expresses her deep gratitude to her mother. Chua concludes the book with transcripts of interview she gave 'in defence' of her memoirs. I read 'Battle Hymn' from the perspective of someone raised in by parents with a similar cultural background to Chua's and who also had goals and aspirations for my siblings and I. I had hoped that this would enable me to empathise rather than cringe, to laugh rather than be incensed. As an academic with a special interest in cross cultural differences, Chua's memoir had the potential to analyse the theories of 'Asian' parenting and why it may or may not translate across the seas in Western countries. Instead, what I read was a detailed shopping list of her personal achievements achieved through battles of wills with her daughters and husband. With regard to writing style, the irony of Chua's love of music was not lost on me. She writes at length about emotion, nuance and subtlety as being integral to fine musical performances. I found her prose clipped and bland in comparison. The only emotions I could detect were arrogance, superiority and self righteousness. All of this clouded the fact that Chua does have an important and true message about being a parent. That children do need guidance and discipline in order that they fulfil their potential. They need the support and involvement of their parents. They need love. All of which Chua does provide in her own way. However, children also need their parents to be role models. Your mother and father are the first people on whom you model your behaviour towards other people and also how you conduct yourself through the ups and downs of life. Being raised 'the Chinese way' does not provide immunity to failure and disappointment. As Chua's daughters approach adulthood and Chua herself gets older and finds her role in their lives changing from task master to a more distant presence, I wonder how their relationships will change. The law of the jungle (including tigers) is the survival of the fittest whether you be tiger cub or ageing tigress. Will the tiger metaphor extend into the future of this family or will the loving bonds and respect for old age of human families prevail?